Species Data Matrices: biological attributes that may contribute to vulnerability. 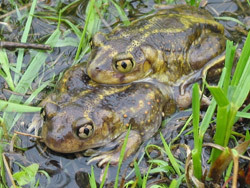 In 2000, the Northeast regional working group of Partners in Amphibian and Reptile Conservation (NEPARC) began work to assess factors contributing to the risk or potential vulnerability of Northeast amphibians and reptiles. This website serves as a repository for the information assembled. Miscellaneous: do humans consider the species to be a threat due to toxic secretions/venom? With these questions, a data matrix was created with herpetofaunal species (common and scientific names provided) making up the rows and the question topics making up the columns. Four matrices were created, one for each of the separate herpetofaunal Orders of the Northeast: Anura, Caudata, Testudines, and Squamata. Over the past four years, NEPARC members have populated these matrices using the scientific literature to answer these questions for each species. The goal was to provide as complete a picture as possible of the status of northeast amphibians and reptiles, as well as of the status of our knowledge of the species. Volunteers were assigned at each of the annual NEPARC meetings to devote time towards each matrix. All information entered into the table included supporting literature citations where possible. Because NEPARC intends to periodically update these files, they have been given a version number. The files presented here represent Version 1.0 of the Risk Assessment data matrices. We hope that from the data provided in these matrices, we can help to drive research efforts on northeastern herpetofauna. In populating the matrices, one preliminary finding is that much still remains unknown for many species, and for many question categories. In this first version of the Risk Assessment matrices, cells that are marked as “unknown” represent topics for which either a) we were unable to find data where data may or may not actually exist, or b) the published literature actually states that the data are unknown. Users should be cautioned that these data files are intended as a starting point or as one of several research tools, not as an exhaustive review of the scientific literature. In addition, although literature citations are provided for data where possible, there are some instances where data are present in a cell, but no citation is provided. We chose not to delete such records, as they may still provide some value. If you are aware of an appropriate citation please contact us. With each version we hope this document and associated files will come closer to representing what truly is known and unknown about these species and hope that this first effort will inspire others to contribute to making these data more complete. Because of the amount of unknowns in the matrices, we have created summaries of these gaps in our knowledge for each taxonomic group (below). The goal of these summaries is to help users to identify species or topics lacking research data, and thus may encourage the development of research questions and projects by graduate students and scientists studying northeastern herpetofauna. Generally, much is still unknown for most species in all four taxa. Only the category of Global Rank is an exception; this information was obtained for all species via the Nature Conservancy’s NatureServe Conservation Status Ranks (off-site link). As one might expect, anurans are most well-studied of the herpetofaunal Orders. In the category of habitat, for all taxa, data are minimal or lacking for amounts of riparian or wooded buffer needed to sustain breeding/nesting, feeding, and hibernation activities. Life history traits for all taxa that remain poorly understood include natural longevity, age at sexual maturity, percent of eggs surviving to adulthood, and collection/harvest pressures or amounts. Movement and habitat use data are especially lacking for territory (if applicable) and home range sizes, as well as for density per hectare. More detailed summaries, by taxonomic Order, follow below and are organized into the vulnerability categories presented in the species matrices. Only the categories where major gaps in our knowledge were identified are listed below. This taxonomic Order is most well-studied among herpetofauna in the northeastern United States. Habitat: With the exception of American toad (Bufo americanus), the amount of riparian buffer needed to support breeding, foraging, and hibernating activities requires further investigation. Life History and Demographic Traits: Areas requiring further study include natural longevity, female reproductive behavior (annually or more than once per year), percent of egg survival to adulthood, and whether and for what purpose species are collected by humans. Movement and Use of Habitat: In this category, data overall are lacking. Specifically, subjects that remain poorly understood include, territory size (if applicable), home range, maximum and average distance that the species moves, whether the species hibernates in an aggregation, and population density per hectare. Habitat: For most salamanders data are lacking for whether species can survive in urban and suburban environments and whether they are negatively impacted by introduced species. With the exception of ambystomatids and green salamanders (Aneides aeneus), the amount of riparian buffer required to support breeding, foraging, and hibernating activities has not been well-studied. For sirenids, and some plethodontids (including members of Genera Desmognathus, Plethodon, and Pseudotriton), habitats used for hibernacula are not known. Life History and Demographic Traits: In this category, the secretive nature of plethodontid species leaves many areas open for further investigation. Specifically, additional study is needed to determine specialized feeding requirements (if any), natural longevity, age at sexual maturity, specialized breeding requirements (if any), female reproductive behavior (once or more per year), percent of egg survival to adulthood, activity period, and collection pressures by humans. Movement and Use of Habitat: With the exception of ambystomatids, data are scarce for most species in this category. In particular, juvenile dispersal and adult movement (including impact of road kill), and territory and home range sizes remain poorly understood. Miscellaneous: Most ambystomatids are documented to have toxic secretions, but information is lacking for whether toxic secretions (if any) are produced by sirenids, amphiumids, and many plethodontids. Habitat: With the exception of smooth green snakes (Opheodrys vernalis), the amount of riparian buffer necessary to support breeding, foraging, and hibernating activities is yet unknown. In addition, further study is necessary to determine the impacts of habitat fragmentation and introduced species, as well as the ability of species to survive in urban and suburban areas. Life History and Demographic Traits: For most species, data are lacking on natural longevity, specialized breeding requirements (if any), and percent egg survival to adulthood. Movement and Use of Habitat: Although few studies have examined squamate movement, data are generally lacking for many species in this category. In particular, juvenile dispersal and adult movement (including territory size, home range, and impact of road kill) as well as population density and distribution remain largely unknown. Habitat: Although knowledge of terrestrial habitats utilized is well established for sea turtles and nesting freshwater turtles, it remains poorly understood for non-nesting freshwater turtles. In addition, further study is necessary to determine the impact of habitat fragmentation and introduced species, as well as whether species are able to survive in urban and suburban areas. One problem identified with the question of riparian or wooded buffer needed is that although this is not relevant for many turtles, data are known to exist on the topic of buffer distances for occupied wetland habitats; we were unable to include these data in this version of the Testudines Data Matrix. Life History and Demographic Traits: Much data are lacking within this category. Specifically, natural longevity, age at sexual maturity (which may differ within the northeast region), and the specifics of mating versus nesting behaviors and requirements need additional study. Although the active season is well-documented, summer aestivation periods may be poorly understood. Finally the extent of collection pressures is not well understood, especially for freshwater turtles. Movement and Use of Habitat: Data are most scarce in this category. In particular, juvenile dispersal and adult movement patterns (including territory size, home range, and impact of road kill) are generally not well known, though local populations of a few species have been intensively studied. Breeding aggregations are better understood than hibernation aggregations. Miscellaneous: Members of the families Kinosternidae (mud and musk turtles) and Trionychidae (softshell turtles) are lacking data on toxic secretions. Downloading the data – Because the full Risk Assessment data matrices are large and difficult to read or print easily, we have created separate, printable files by question and by taxon. These files are in pdf format. Upon request, NEPARC can provide the Excel spreadsheet containing the entire matrix for an Order. Send email requests to one of the NEPARC Co-Chairs (contact us).